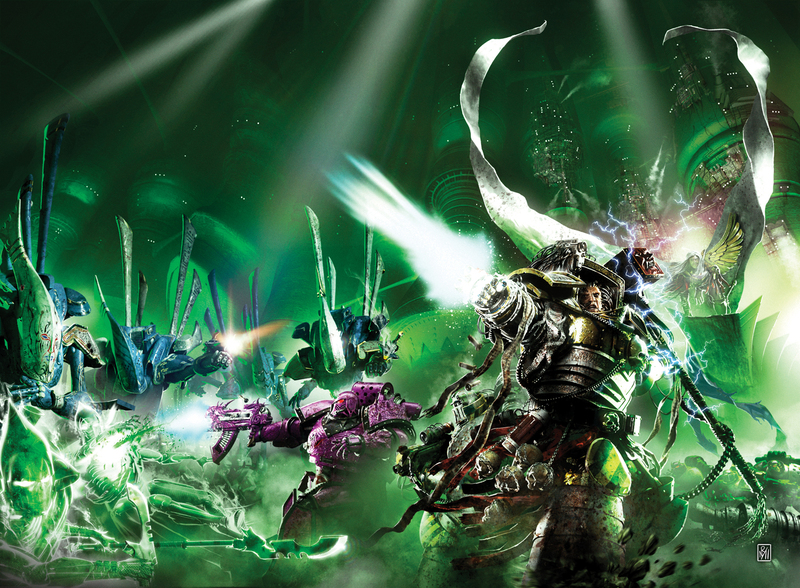 Discover one of the fiercest fighting Chapters in the Universe: The Ultramarines 4th Company! Sergeant Learchus must take newly recruited Battle Brothers on their first engagement, as they embark on an investigation of the lost patrol ship Guilliman’s Honour. What was a routine mission becomes much more when 4th Company encounters one of the Imperium’s deadliest enemies! One of the things I like about this medium of stories is that you can use the artwork to really showcase the big, epic battles and war machines. In this case it was a gargant. I remember the first time I saw a picture of one such war machine (in the old Epic rulebook) and being totally blown away by it. I knew I wanted one of them in this book. Defenders of Ultramar was a chance to tell an archetypical story of Space Marines, and use it to fill in the blanks as to what had been happening with the 4th Company while Uriel was on his Death Oath. It was also a chance to develop Learchus’s character, since he hadn’t been seen since the short story, Consequences. He hadn’t appeared in a novel since Warriors of Ultramar, so it was time to redress that balance. I was reintroducing him in Courage and Honour, and wanted a bit of tension between him and Uriel. They’d been rivals growing up, but had – as Space Marines – put that behind them. To reignite an element of that, I needed a reason they’d be rivals again to have that dramatic tension. In this story, Learchus commands the 4th Company against an invading host of orks, acquitting himself nobly and with great courage. At first he’s resistant to take the mantle of command, as he feels he’s just looking after the company until Uriel gets back. But by the end of the story, he’s grown into the role to the point where he feels that the company should be his. He’s accepted that Uriel probably isn’t coming back, and his conduct in this war has shown him that he can do the job too. Of course, things aren’t that simple, and when Uriel does come back, it puts a crimp in Learchus’s ambition. With The Chapter’s Due coming up, I knew I needed to re-establish Learchus’s credentials, since he and Pasanius would be shoulder to shoulder in that novel, and he had to have suitable presence in order to avoid being overshadowed. Given that he had been the one who got Uriel sent on his Death Oath, a lot of readers didn’t like him, even though (as Uriel says) he absolutely did the right thing. Courage and Honour lifted him up again, and Defenders of Ultramar give him that final push of credibility. At the opening of The Chapter’s Due, Learchus had regained his position as a main character – which was just as well as I had some heavy stuff planned for him to do in the next novel. Some of that we got to see, some of it will be saved for a later day, but you haven’t seen the last of Veteran Sergeant Learchus.